Greetings from Vietnam! In the immortal words of Mick Jagger: Please allow me to introduce myself! I am a physical therapist and failed subsistence farmer from America. 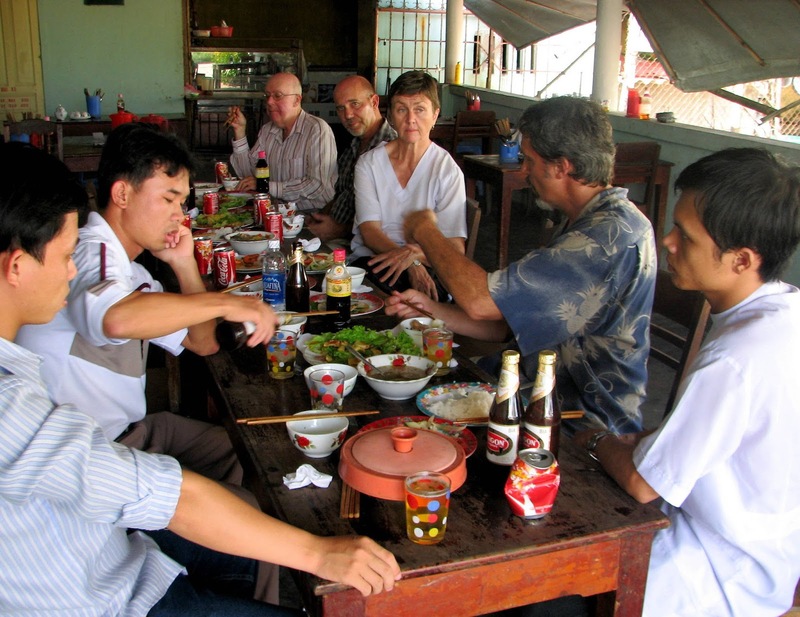 In this new blog, I'd like to share with you some hard-won experience from our eleven years of farming experience in America, as well as some observations on how life works here in Central Vietnam. Here, in a nutshell, is the essence of what I have learned by meditating on the failure of our farming adventures and through what I am observing here in our new life in Vietnam: COMMUNITY IS ESSENTIAL! Have you ever read the Little House on the Prairie series of books by Laura Ingalls Wilder? I did. In fact, I read most all of them aloud to my home-schooled eldest daughter. In retrospect, I think that I inadvertently merged the idyllic picture of the bountiful life depicted in Farm Boy, a romanticized account of Wilder's husband's childhood on a prosperous farm in upstate New York with the isolation and do-it-yourself childhood of Wilder herself depicted in Little House in the Big Woods. I had a lot of support in this delusion, of course, having been steeped in the notion of American individualism and supposed self-sufficiency. In reality, survival--let alone thriving--as a solitary individual or nuclear family is well-nigh impossible. We need each other. We have evolved to work and live in community with one another. That about sums up our situation, peering forward into the post-collapse future, wouldn't you say? It seems that I piqued the curiosity of some readers of my initial blog post when I referred to myself as a "failed subsistence farmer." Let me clarify what I meant by that. Twenty-five years ago, my husband and I, setting out with absolutely no previous farming experience beyond five years of vegetable gardening in a different climate zone, embarked upon an adventure, the goal of which was to become totally self-sufficient back-to-the-landers--initially in a rental situation and later on our own derelict 13 acre farmstead. It was the most intellectually challenging and, in many ways, satisfying time of my life. We accomplished amazing things that were entirely outside our previous range of experience but, had we had to rely entirely upon ourselves, without an outside income that allowed us to purchase inputs from the corporate-based economy to fill in the gaps where our efforts missed the mark--quite frankly--we would have starved. It was a great and fascinating experience, but the most important thing it taught me was that even the most dedicated and motivated novices will not be able to sustain themselves in isolation. You need community in order to survive. And your group needs not only arable land, skill sets, tools, seed stock, physical strength, empathy for one another, and an ability to "think outside the box"--but you need to have the knowledge and culture base that forms that "box' in the first place. It is axiomatic in our circles that the complexity that we perceive in our global system of food production and life support is its Achilles heel. It's a fact that most Americans, for example, don't give a thought as to how the buildings they inhabit manage to maintain a constant temperature , nor do they meditate upon the nature and history of the Slim Jim that dangles from a hook beside the cash register of the perennially well-stocked convenience store. We could watch a movie like Food Inc. or read Michael Pollan's brilliant opus The Omnivore's Dilemma and decide that we could bypass all that seemingly unnecessary added transport and processing and just go for simple, natural foods that we could produce ourselves, if we only had a bit of land and learned a few techniques from yesteryear. Let me tell you, though--this stuff ain't simple! 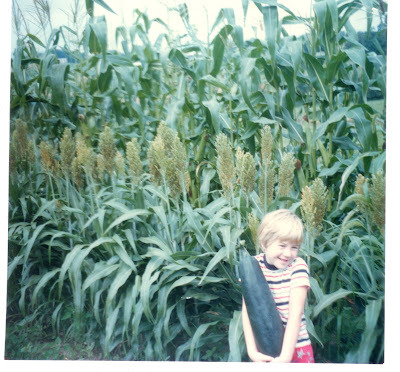 Trying to become a self-sufficient farmer was absolutely the most complex challenge I've ever faced in my life. Despite the implied message of our educational system, humans did not evolve to gain skills and knowledge from lectures and textbooks. We humans are endowed with something called mirror neurons, which are key to how humans learn the language and skills that set us apart from the rest of the animals. (You can read a bit more about mirror neurons here). Basically, we copy what we see and we hone those new skills through practice. I devoured how-to books on farming and gardening and food preparation and the like, but you need some real experience to attach those abstract new ideas to. For example, it is true that I learned how to castrate pigs from a library book. However, I did have a base upon which to add that nerve-wracking skill. During my years of study to become a physical therapist, we had to dissect a human cadaver--which we did by following the example of our instructors. Later, I spent a lot of time surgically debriding (removing dead tissue from) wounds of very much live people after--once again--observing someone else do it. While castrating squealing, wriggling baby pigs was extremely stressful--to me and the pigs--it did build upon a skill set that I already possessed. 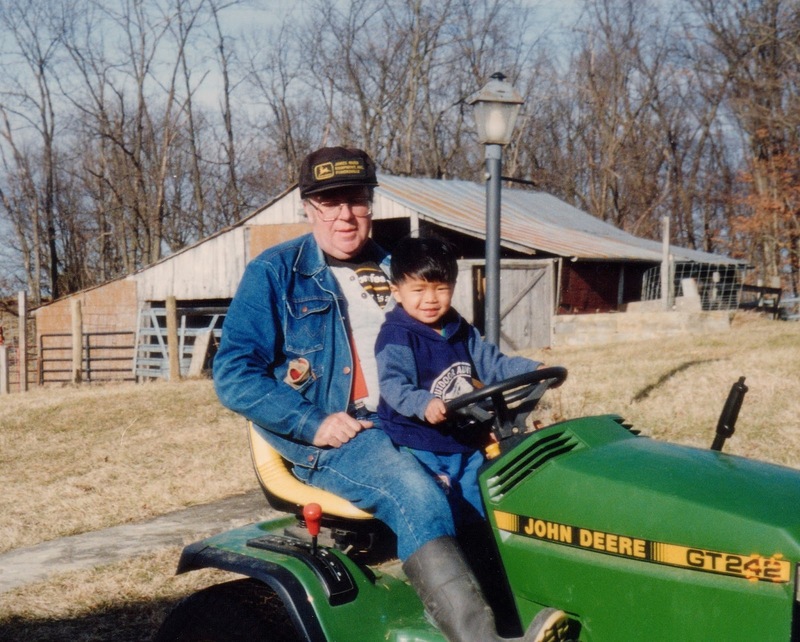 When we were starting to farm more than twenty years ago, the folks whose guidance I sought out--who had spent their youth on subsistence level farms--were already in their eighties. They're all dead now. How in the world can we conjure up that lost culture of subsistence, let alone adapt it to this rapidly changing planet and climate? I really do despair for the US. I'm sitting here, in the very flat coastal city of Da Nang, Vietnam, within two blocks of the South China Sea, fully cognizant of the inevitability of increasingly intense storms and rising sea levels and, ironically, I feel safer here--because I'm living within a culture that knows how to survive under really adverse conditions. I'm sure it's going to be rough here. Much of the surrounding countryside, as well as parts of the city, are underwater at least once a year due to flooding. Dengue fever sweeps through periodically, inflation is rising, and access to Facebook in Vietnam has just been cut off by the powers that be. You've got your concerns and I've got mine. Let's keep sharing our thoughts and experience and try to make the time that we've got left count for something good. Let's play "What do we know?" 1) We know that sudden, catastrophic collapse is imminent. 2) We know that, right now, virtually no one in our respective locations is open to the idea of discussing this, let alone preparing for it. 3) We know that, no matter how much we stock up in the way of emergency supplies, those supplies won't last indefinitely and we will need to find new ways to sustain ourselves over the long haul. 4) Long-term survival in the aftermath of systemic collapse will require community. So that brings us to the key question, "How can we foster community?" All of us reflecting upon the inevitable impending collapse of the global economy, peak oil, and climate change have similar concerns and many of us who have some experience and knowledge feel led to share our insights with like-minded folks. The problem, of course, is that we are widely dispersed and, in most cases, will never lay eyes upon each other, let alone plant potatoes or set up water filtration systems together. The folks who could potentially be there for you when your husband falls off a ladder and breaks his arm--or weevils have destroyed your stored grain--live within walking distance of your home. Let's be honest about this. We don't trust our neighbors. This is true in the cities of Vietnam, as well as in America. Vietnam has a history of civil war and a more recent one of migration due to economic circumstances (i.e. ; the dearth of economic opportunities in the countryside.) The media in both America and Vietnam harp on crime (be wary of the other) and individual success stories (lottery winners, movie stars and successful entrepreneurs). You'd be hard-pressed to find compelling stories in either Vietnamese or American media of unrelated individuals banding together to support one another. And yet that's exactly what tribes of traditional people do. Plains Indians both hunted and processed buffalo as a community. Hog butchering, likewise, was traditionally a communal activity in America. The Amish do not charge their neighbors by the hour when they participate in a barn-raising. 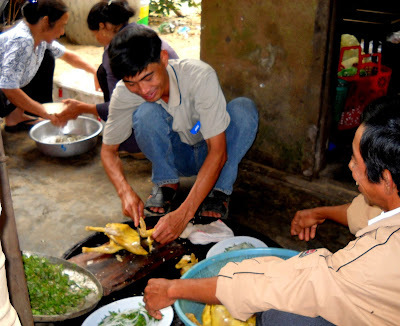 And both Irish and Vietnamese traditional cultures dictate that neighbors step forward to help prepare the body of a deceased community member for the wake which is held at the family's home. It's obvious to us that many of the trappings of "normal" modern life must fall by the wayside as we spiral into the collapse of our globalized, petroleum-dependent society. We stand ready to give up Hummers and Big Macs and maybe even Diet Coke. But I think that, if we have any hope of having a life worth living after all is said and done, that we need to examine carefully the baked-in assumptions we hold as a result of having spent our lives thus far in a corporate-produced culture. Your neighbors may have "incorrect" political views and some funky personal habits but, in the end, it won't be Dennis Kucinich or your sister in Poughkeepsie keeping a nightly look-out for chicken thieves with you. And none of your virtual friends at Peak Prosperity will be there to help you patch your roof--it will have to be those less-than-perfect neighbors. So here's my idea: consider investing in a BIG (restaurant/institution-sized) pot, a long-handled spoon and maybe a free-standing propane gas burner and a bunch of stackable plastic lawn chairs. Now go out and buy a LOT of soup bouillon and perhaps some dehydrated veggies, bulk rice, oatmeal, grits, or whatever seems right to you. Then, when times get tough, you'll be ready to serve up a hot daily bowl of fill-in-the-blank in your carport or garage or front yard to whomever shows up. Invite folks to bring their own bowls and to settle down to eat and talk. You'll have planted good seeds in what will certainly, at that point, be fertile soil. See what develops . . . maybe you'll grow a community! The bulk of motorized two-wheeled transport in America consists of either motorized bicycles or enormous Harley-Davidson clones--both of which are generally considered to be dangerous toys (a Harley viewed as an extravagant one and the moped being merely comical)--rather than as serious modes of transportation. 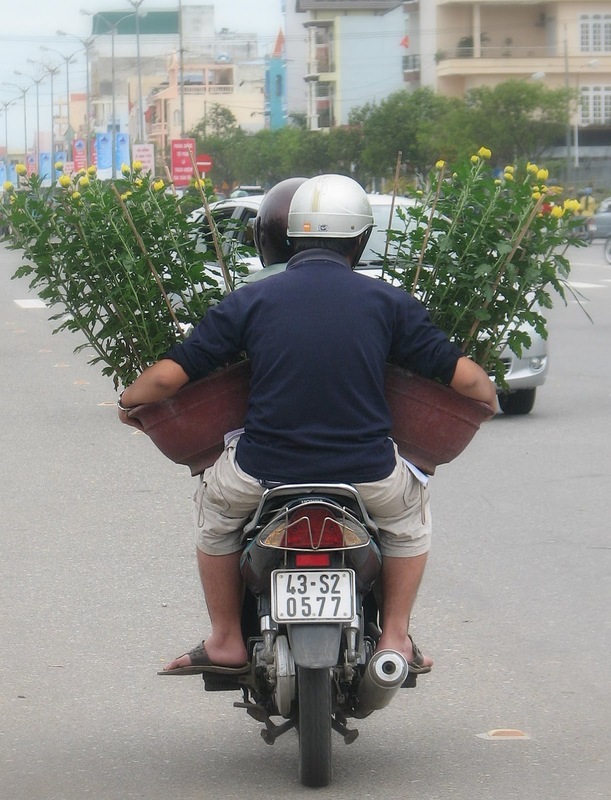 In Vietnam, 110cc "underbone" style motorbikes such as the Honda Wave represent the basic mode of transportation. Unlike Harley owners, Vietnamese ride their bikes rain or shine--along with their kids, their groceries and even live pigs, chickens, and plate glass windows. It can get a bit dicey at times but--with the bike's low center of gravity and ease of operation--even a fifty-something year old American woman like me can learn to operate one with confidence. 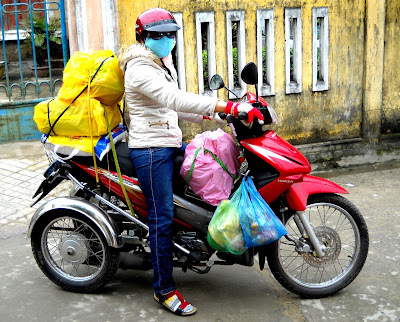 Modification of the basic bike with kits (which are readily available in Vietnam) enables even disabled folks to travel independently by motorbike. All told, these small motorbikes have contributed greatly to the enhanced quality of Vietnamese life over the past decade. With their fuel efficiency and relative ease of maintenance, one might well be a valuable asset in a survival-oriented post-Peak Oil community. So, here I am, some 17 years after I last plowed and harrowed a field in the Shenandoah Valley of Virginia behind a marginally trained Quarter Horse in harness, and some 25 years after last hand-spading an expansive garden mulched with peanut hulls in an oceanfront community in Virginia Beach, trying to figure out the logistics of growing veggies on a rooftop in Da Nang, Vietnam. Well, as you can see from the above photo, I clearly don't have a lot of space to work with--only a narrow tiled pathway between a low masonry wall and a pitched metal roof that that I access from the doorway of my second floor bedroom. So, space is at a premium and the sun, during our eight month long summer, can be relentless. Vegetables are grown on a strictly seasonal basis in the countryside surrounding Da Nang--the relevant seasons being the wet season and the dry season. 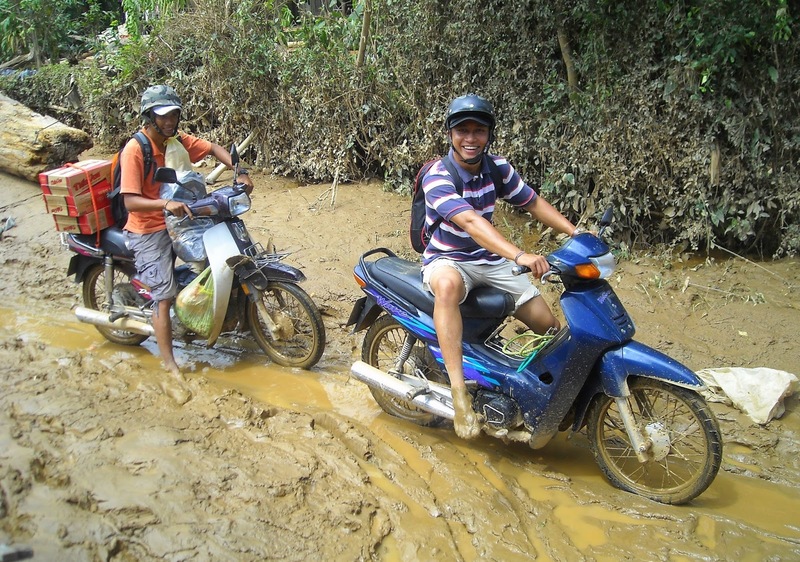 The wet season brings floods of amazing depths that no vegetable crop could withstand. It does, however, bring new soil from the mountainsides and also recharges the soil with moisture. Once the floods recede, crops grow beautifully in the fields--until, that is, the summer sun turns everything to toast. Low lying paddy fields in many areas are set up to accept the controlled inflows from irrigation channels in order to produce rice during the summer months. Higher lying fields, or fields situated in non-irrigated areas (close to salt water, for example) generally produce only marginally once the summer heat sets in. 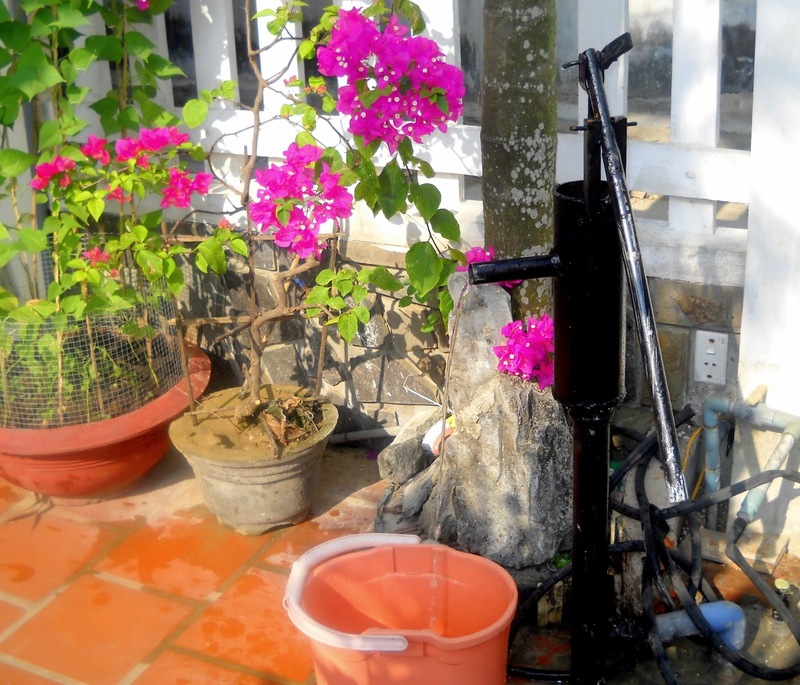 I figured, since my veggies are situated on the second floor of a house in a well-drained neighborhood in Da Nang, in a place blessed with both running water from the city, as well as ground water issuing from a hand-operated pump that we recently installed in our front courtyard, that floods and drought were irrelevant for us and that we should be able to produce fresh produce all year long. I thought that our only concern would be to ensure that my rooftop garden was well-watered and that I could produce a cornucopia of foodstuffs with minimal effort. Study that picture once again. I'll also mention that it is situated on the south side of my house and that there is no structure to the east to shade my house in the mornings. 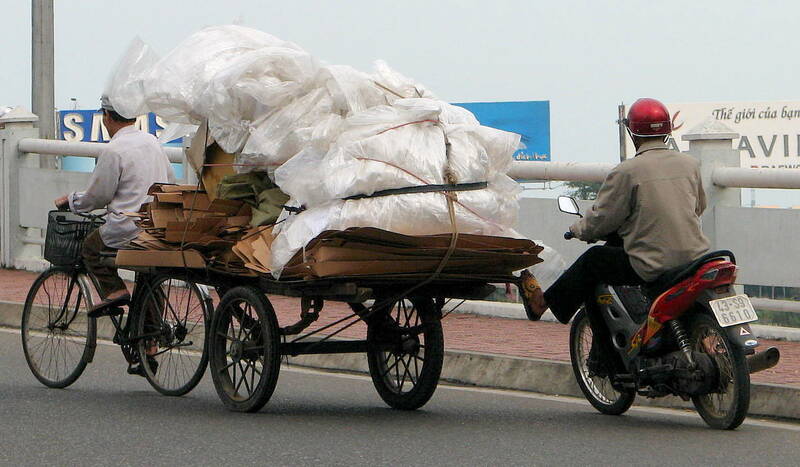 I've got ten styrofoam crates of soil, mixed with composted cow manure (all of which had to be transported via uncounted motorbike trips from the surrounding countryside and carted up the stairs to the second floor because we live on a sand bar, two blocks from the South China Sea.) The crates--which were used originally to transport fruit, and are generally recycled to haul fish and also to serve as refuse containers--utilize my narrow strip of potential garden better than any traditional flower pots. The soil is certainly deeper than it would be in normal gardening containers and I do water religiously, allowing time for the chlorine in the city water to off-gas in five-gallon buckets for a day before I use it. (We refilled our freshly cleaned goldfish pond with city water straight from the tap one day and the chlorine level on that particular day killed all the fish in a matter of hours!) Plants start off great in my roof-top containers and leafy veggies (lettuce, Swiss Chard, and mustard greens) produce well. The tomatoes, eggplants, and zucchini started off well also, and produced copious amounts of foliage--but little to no edible fruits. So, what's the deal? I've got several hypotheses, including airborne emissions from a near-by rubber plant and my failure to water deeply enough at first. The chief suspect, however, based on observing the results of our failed attempts to grow beans in our front courtyard and greens in our mostly shaded clothes drying area, is one that I never would have anticipated here in the sunny tropics, where pale Caucasian skin can burn to blisters in short order: insufficient hours of direct sunlight. While it feels like summer for most of the year (although, interestingly, it's not as hot here as it was in the US last summer), our day length is a mere twelve hours long, year in and year out. Now consider that my crops are not out in the middle of a sunlit field, but are situated on the floor of my rooftop. Even though the sun rises here about six AM, the low eastern wall prevents the sunlight from striking the soil surface in those styrofoam crates until around nine AM. And then, after about 3:30 PM, the soil surface is shaded once again--first by the adjoining metal roof, and then by my neighbor's house to the west. 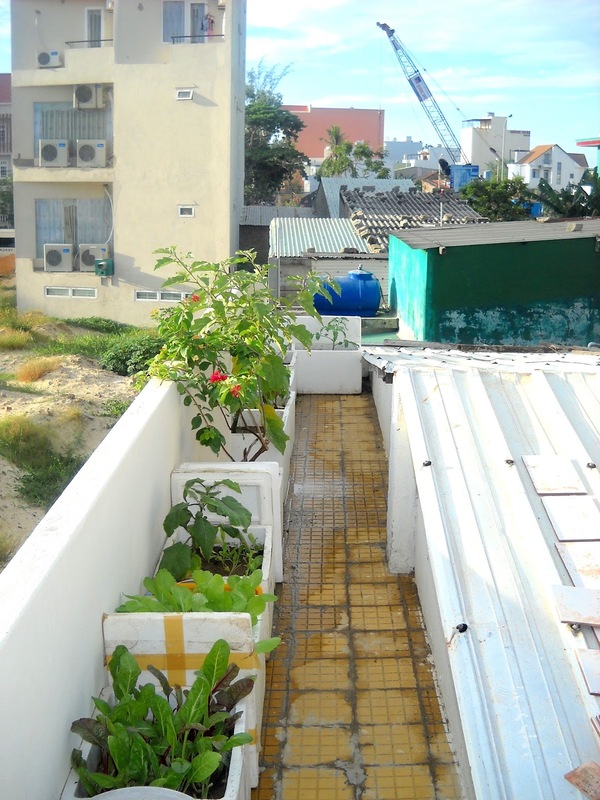 While the ambient air temperature is quite hot out on that rooftop and the intense sun makes it supremely uncomfortable to stand there in the middle of the day, it seems that the abbreviated day length that the plants sitting on the surface of that tiled walkway experience is insufficient for them to produce fruit and is merely adequate for leaf production. Which just goes to show that, if you are serious about food production, you had better start experimenting and learning from experience in your own unique setting. You're not going to learn all you need to know from a book or a class or even from your own experience gardening elsewhere. Don't plan on waiting until the SHTF to start gardening. Start now, and learn from your mistakes while there is still time. It would take a rare and dedicated person in an ideal situation to produce all the carbohydrates that their family requires. I never was able to do that, even on my little Shenandoah Valley farm--chickens ate my emerging wheat, geese ate my black-eyed peas, and I impaled my hand on a rusty wire while hanging seed corn from the barn rafters in an abortive attempt to follow seed-saving instructions that I found in an ancient Agricultural Extension Service booklet. Your best bet, for the immediate unknowable future is to stockpile a LOT of grain (rice works for me) and to try to grow greens to supplement that basic carbohydrate source with vitamins and minerals. Swiss chard grows well in the summer without bolting to seed and kale is extremely winter hardy. Both will continue to produce, or at least survive, into the winter in the temperate zone if you protect them with a cold-frame and--protected-- can take off growing in the spring before anything else gets started. My advice? Buy rice, get seeds for greens, research cold frames, and start growing! Let's talk about laundry! It seems to me that those collapse-conscious folks who don't ignore the topic of laundry either anticipate a grueling regime of boiling clothes with home-made lye soap, beating clothes on a rock in a stream, or else getting used to living in filth and squalor. Hard as it is for folks to believe who grew up with the convenience of automatic washers and dryers and listening to tales of the bad old days of starch and lye, wringer washers and/or boiling vats--there is a completely different, totally reasonable, tradition of clothes washing which I've observed over the time that I've been in Vietnam. Let me preface this by saying that this alternative tradition works best when you make a few other modifications to your life style as well. 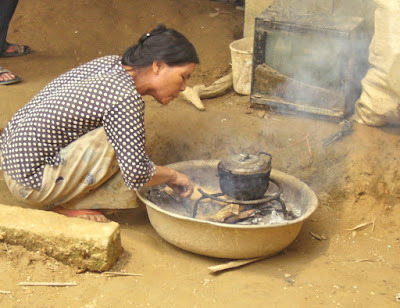 The Vietnamese people that I first encountered in 1995--as well as many now--generally have two sets of clothing and don't utilize the standard Western top sheet/bottom sheet/pillowcase style of bedding. (This would have been typical of Americans and Europeans in earlier, less affluent circumstances as well.) Vietnamese people, in general, pay a lot of attention to personal cleanliness. I have rarely encountered anyone with noticeable body odor and even soiled clothes are unusual aside from mechanics and masons who are actually on the job. Footwear is customarily removed at the door and feet, as well as the rest of the body, are typically washed before one retires to bed at night. On hot days, people make every effort to avoid being out in the heat at mid day and often take a quick shower at mid-day to cool off. So, right off, you can see that homes and bodies are kept pretty clean here. Although clothes dryers are almost unheard of, I've never seen a dedicated clotheslines out in the middle of an open yard here either. Drying clothes in our hot, dry eight-month long summer is pretty straight-forward: clothes are generally hung on hangers and then suspended on wires along sunny walls, or on metal clothes racks on balconies or in breezy hallways where they dry quickly. In the rainy season, when the only breaks between downpours are oppressively humid, it gets a bit trickier. Clearly, you need a sheltered spot to hang the clothes. 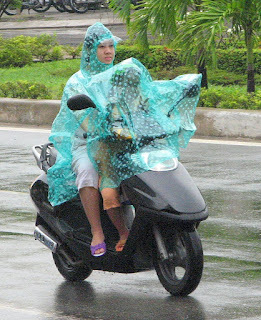 Even then, however, clothes probably won't get 100% dry. (That's probably the number one reason we don't use closets here--everything would get full of mold and mildew.) Spacing out the suspended clothing and using an electric fan to move the air can be helpful. Also, using an iron to press the clothes can eliminate residual moisture. You can see, however, that having an abundance of extra clothing and bedding to store is not necessarily an advantage in a perennially damp environment. 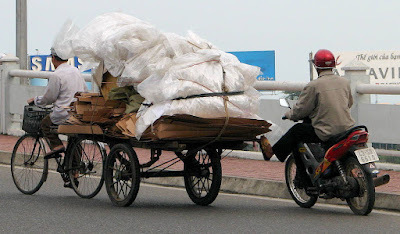 Right now, Vietnam is in the midst of an economic boom and middle class folks are buying refrigerators, water heaters and washing machines right and left. 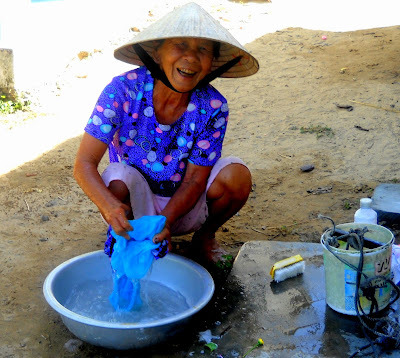 But prior to this time, EVERYBODY washed clothes by hand--and it was a casual, everyday affair--not some arduous task left for mom to do one day a week. It's something typically done at the same time you wash yourself up, either in the bathroom or out at the well. Even in the 1980s, when folks had barely any money and Vietnam was under a US-imposed embargo, folks put up the money to buy a bit of detergent--and they used it in cold water. That's something to realize--soap may require hot water to be effective, but detergent does not, especially if you're not dealing with a heavy amount of grease or oil. All you need is a basin, some water, detergent, and a brush. If you're using a plastic or metal basin instead of a sink or a bathtub, it allows you to readily utilize that waste water for some other purpose (cleaning the floor or watering plants, for instance) and is convenient if your normal home plumbing (incoming or out-going) is either not functional or if the tub and sink are otherwise employed. Of course, this style of washing works the best if you've already mastered the Asian Squat! 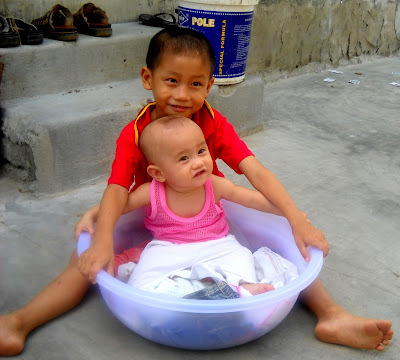 Photos by Nguyen Thi Thuy Trang.